There are several themes in relation to the 2nd wedding anniversary, although there is no need to feel bound to use any of the recognised traditions. A gift for this anniversary year can combine any or all of the themes to make the ideal present for the 2nd anniversary. The durability and flexibility of the material cotton is what makes it the perfect theme for the second wedding anniversary, reminding the couple of their need to stay strong just like the fibres of cotton, interwoven with each other. This represents a couple becoming ever closer through their marriage as time goes on. 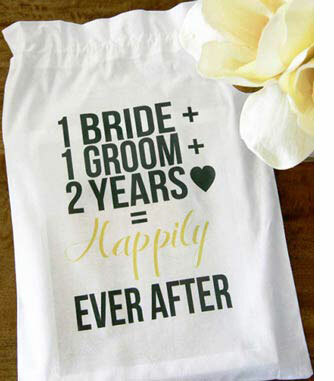 The modern theme for gifts on the second year of marriage is china, elegant and stylish just like married love. It is also important for the recipients to note however that china can easily be damaged because of its fragility, just like a marriage, so care is paramount. Flower: The cosmos and the lily of the valley are the two flowers linked with two years of marriage. The cosmos represents peacefulness and modesty in its ornamental beauty. The lily of the valley is a wonderful floral gift to capture the purity, sweetness and trustworthiness required in a successful marriage. A red rose, alternatively, would be a beautiful second anniversary gift, in connection with the colour theme of the 2nd wedding anniversary.